The petition for the establishment of a parish was accepted by Metropolitan Leonty in January 1963. 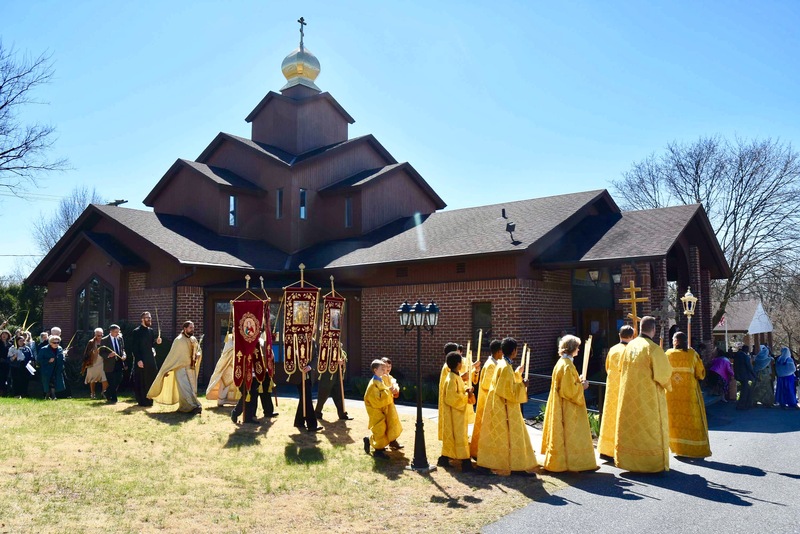 The new parish was given the name "Christ the Saviour Eastern Orthodox Church" with the Holy Resurrection as its feast day, and placed in the Diocese of Wilkes-Barre. Father Michael Rachko was assigned as parish priest. With the donated services of George W Gekas, Esq., US Congressman (1983-2003), the parish in 1964 compiled its constitution and bylaws based on the Normal Statutes, and was incorporated as a non-profit organization. The first Divine Liturgy was held in a second floor "upper room" at the YMCA in downtown Harrisburg on March 10, 1963. During this early period the parish council worked long hours and held many meetings to resolve various details that new parishes have. One main issue was to find permanent quarters for worship, and in March of that year the parish leased a "house chapel" from Epiphany Lutheran Church in Harrisburg. Many liturgical items and church furnishings were donated from other Orthodox churches and the Lutheran church. During these earlier years the parish began to take shape and grow. Some parish organizations, the choir, and Sunday School were organized. In 1965, Father Michael Rachko was relieved of his duties as priest of the parish. Father Daniel Ressetar, a former US Air Force Chaplain previously stationed in San Antonio, TX, was assigned to the parish on July 1, 1965. Father Daniel retired in 2006 and is attached to the parish as Pastor Emeritus. Father Michael G Kovach, retired from his post at Millersville University, and was attached to the parish in 1986. Father Michael fell asleep in the Lord in 2013. May his memory be eternal!. Over the years, the parish continued to grow rapidly. Several new organizations were formed, providing members opportunities for stewardship and fellowship. Fund-raising activities were held to help defray the mortgage which was "burned" in October 1976. Regular anniversary celebrations were held over the years, along with different special events, lectures, and retreats. Christ the Saviour Church celebrated its twentieth anniversary in November 1983. During this year, a pledge drive was started for the building of a new church. With the financial goals reached, the design of the new church by Father Alexis Vinogradov, a priest- architect, was approved in late 1985. Groundbreaking ceremonies were held on April 6, 1986 by Bishop Herman. Construction commenced later that year, and the first Liturgy in the new church was celebrated by Father Daniel on August 23, 1987. A new Iconostas was constructed, with the icons written by Father Theodore Jurewicz. The old church was renovated into the parish hall. The consecration of the new church was held in conjunction with the parish's 25th anniversary on September 24-25, 1988. Metropolitan Theodosius and Bishop Herman officiated, along with Father Daniel, Father Michael, and visiting clergy. The following year, Bishop Herman blessed the new bell tower donated by Stephen and Katherine Macut. Throughout the years, the parish hosted many events. Among these were retreats, FOCA [Fellowship of Orthodox Christians in America] conventions (both district and the 1994 and 2002 national conventions), winter mixers, dinners, sales, Lenten Mission services, including the Sunday of Orthodoxy, and a Thanksgiving service for the Millennium of the Baptism of Rus in 1998. Some of the honored guests who have visited the parish include Metropolitan Theodosius of Tokyo, Metropolitan Anthony of Chernigov, Archbishop Alexey of Kazakhstan, Archbishop Abel of Poland, Mr. Nicholas Zernov of England, Mother Alexandra of Holy Transfiguration Monastery, Fathers Vladimir Borichevsky, Alexander Schmemann, Thomas Hopko, John Nehrebecki, Paul Lazor, Michael Dahulich, Peter Gillquist and the choirs from St. Tikhon's and St Vladimir's Seminaries. In October 2006 Father Daniel retired after 41 years of active ministry at Christ the Saviour. In February 2007 Father Seraphim Majmudar was temporarily assigned acting rector, while a student at St. Tikhons Seminary. In June 2007 Father Stephen Vernak was assigned to the parish following his graduation from St. Tikhons Seminary, and was formally installed as Rector by His Grace Bishop TIKHON in November 2007.